When it comes to authentic Mexican food in D.C., it’s hard to beat El Sol Restaurante & Tequileria. After all, the restaurant’s owners were born and raised in Mexico City. Sibling chefs Alfredo and Jessica Solis’ mother sends weekly shipments of mole rojo, a dark peppery Mexican sauce made with dark chocolate and beer, straight from Mexico to serve up the zesty flavors of their home country right in the District. The siblings crafted a menu inspired by the foods they grew up eating, including huaraches, which are Mexican flatbreads with refried black beans, cheese, cactus, sour cream and lettuce ($9). Don’t worry, the restaurant also offers all your Mexican favorites like tacos ($2.50 to $3 each) and quesadillas ($9 to $9.50 each). In all of the tacos and quesadillas, you can choose from safe bets like steak or chicken or try a more exotic filling like braised beef tongue. The restaurant also has over 60 tequilas on hand and you can trust they’ll keep your glass full. El Sol offers a reasonable three-course weekend brunch deal for $17.95 that includes an appetizer, entree and dessert that are all authentic Mexican favorites. Appetizers like ceviche, fresh fish cured in lemon juice, and entrees with ingredients like chorizo and crumbly Oaxaca cheese will make you feel like you’ve been transported to Mexico. Homestyle details in the food like tortillas made in-house every two to three hours, combined with the family-run vibe, creates a comfortable dining experience with hearty portions that rivals more expensive D.C. restaurants. 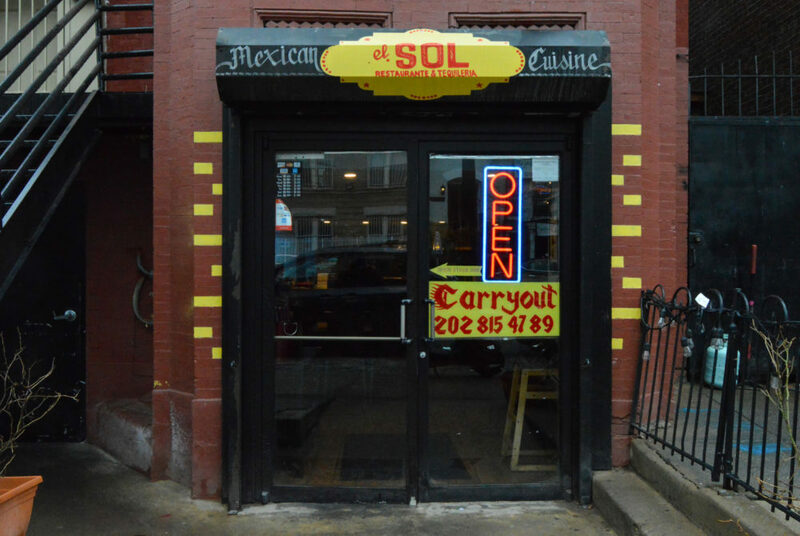 El Sol’s atmosphere borders on hole-in-the-wall, and the cozy neighborhood space is a true hidden gem of the D.C. Mexican food scene. The restaurant can feel crowded when busy, but the service is never rushed, which allows you to relax and enjoy your authentic Mexican cuisine.